Bitcoin has crossed the $1,000 mark by a healthy margin now, and looks to challenge the previous all time high of $1,216. $1,000 is a psychological line more than a barrier of resistance, which saw bitcoin reject the $980 level multiple times before finally giving way. Like all previous resistance levels, $980 succumbed after a small period of consolidation. Looking at the TradingView 24-hour chart below we can see exactly how the $1,000 level acted as a psychological breakthrough for traders. $1,000 broke and we saw a flood of buying coming in immediately, driving the price to $1,005. Despite the mass buying pressure sellers taking profit were able to drive the price back down below $1,000 for a short period. Traders can take note of this and other levels of note. You will often experience a sell off after a psychologically important level is broken, due to longs taking profit. $1,000 had been broken before and looked to be a safe place for conservative longs to take their profit and get out. $1,000 then quickly rebounded and action has been frenetic since then. Swing traders are encouraged to start looking at historic levels of resistance, and psychological levels. $1,100, $1,120, and $1,200. You can anticipate a sell off once those levels are broken, then a recovery shortly after. Short and then long positions, respectively, can be established at those points. A look at the Relative Strength Index chart shows us that pattern trading is no more than a guessing game at this point. 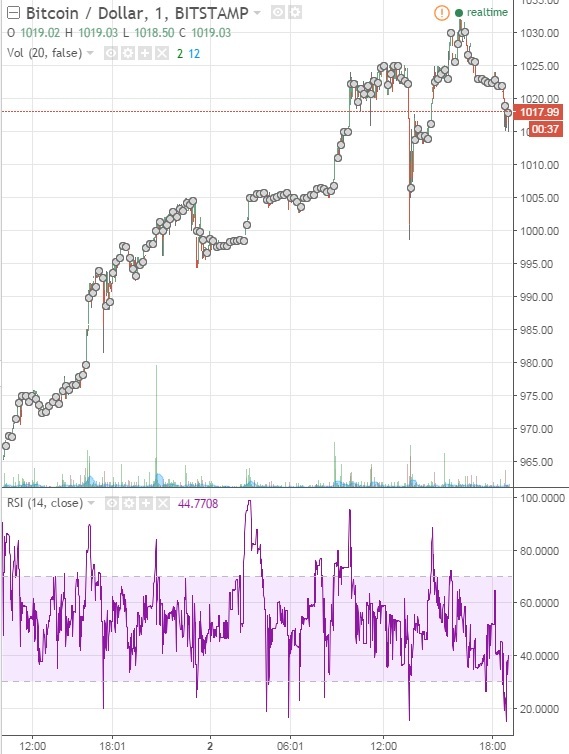 Breaches of 70 RSI do not lead to immediate drops, breaks below 30 RSI do not lead to immediate upswings. There are simply no avenues for short-term traders to take advantage of the current volatility, despite heavy volume. Long-term traders are still in a very strong position. At this point it is difficult to foresee bitcoin failing to at least challenge the all-time high. Long term traders can probably expect frenzied trading and a very fast bull run past that $1,216 if historical resistance levels at $1,190 and $1,205 fail to materialize. If the run to $1,216 does indeed take place, we then need to talk about exit strategies and profit taking. One critical item of not is that this run has been almost surgically consistent. Every single significant level of resistance has been crushed after a small period of consolidation. Longs have not only held a momentum edge, but have a number of significant catalysts working in their favor. Currency policy in India, a cash crisis in Venezuela, and a possible trade war brewing between China and Donald Trump’s Administration, have significantly added to the value of bitcoin. With interest rates finally on the rise as well, there is simply a lot of weight behind bitcoin’s bull move. As we approach the all-time high of $1,216 however, we are entering uncharted territory. No pun intended there, we simply do not know what is next. If you believe in bitcoin as a technology, and as a significant player in a quickly changing world, then keep a core position. It is however, encouraged to start taking profits at this level. Nothing can go up forever, and as we saw the last time bitcoin reached these lofty heights, it has a long way to possibly fall when it does. Long-term holders should look at this huge bull run as an opportunity to recover at least the initial cost of their coins. This strategy allows you to speculate with your remaining coins. As exciting as bitcoin is, it is much better to speculate on it completely free from risk.